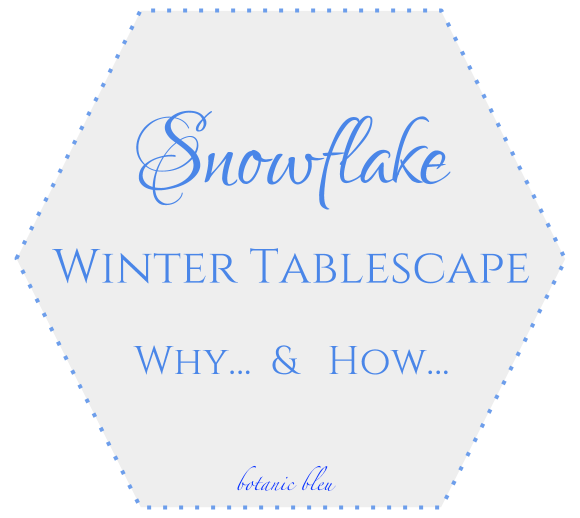 Why and how are interwoven strands that are not easily separated, but for the next few minutes, I will offer why as well as how to create a snowflake winter tablescape. The whys will not be why a SNOWFLAKE table setting, but whys of setting beautiful tables in general. Just as no two snowflakes are alike, the whys I offer may not be the same reasons for everyone who spends extra time, energy, and resources setting a beautiful table. Meals fuel our bodies; beautiful settings fuel our spirits. One of the hallmarks of French Country is living with style in everyday life, not just in special occasions. Joy is found everyday. We feel better and function better when we are surrounded by beauty. In the midst of winter, overcast skies and being cooped up inside with no outdoor physical activity can cause the winter blues. One way to fight those blues is to create lovely spaces in our homes, including tablescapes. 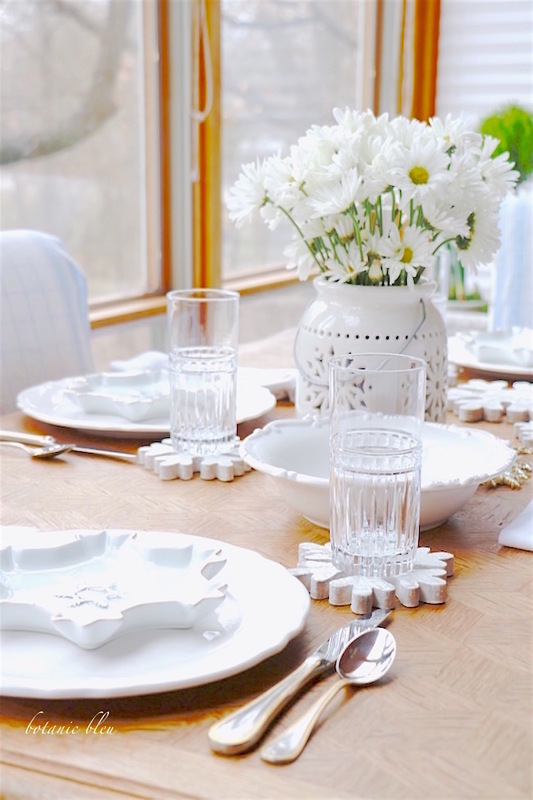 White dishes, white flowers, and white accessories lighten our moods and replace some of the light lost from bright sunshine. A well-documented fact is people can suffer depression caused by light deprivation. Remember those low-hanging gray clouds and a short number of daylight hours in winter? Going to work or school in the dark and coming home in the dark? Even my light-filled sunspace has an overcast gloom caused by several days of rain. 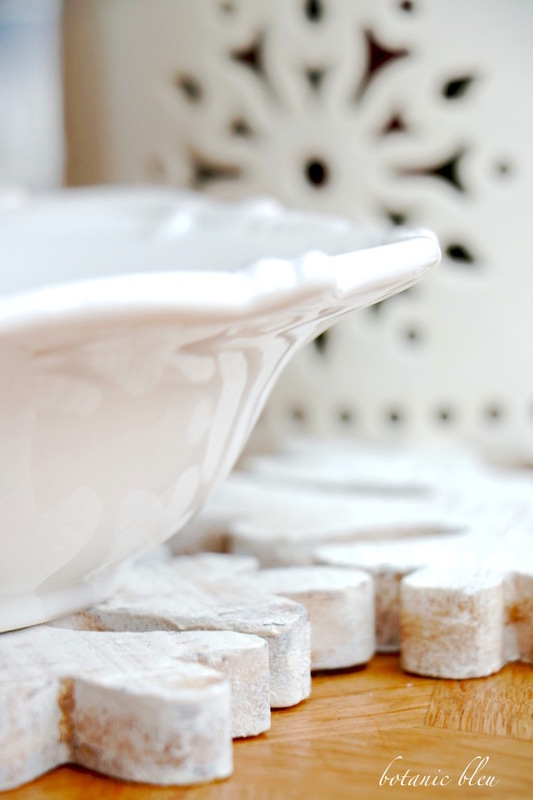 White will help brighten our homes... and our spirits. with a napkin, not a paper towel? Besides to create a beautiful setting for joie de vivre (joy of living)? Habits are developed over time. What we do routinely is how we will act. 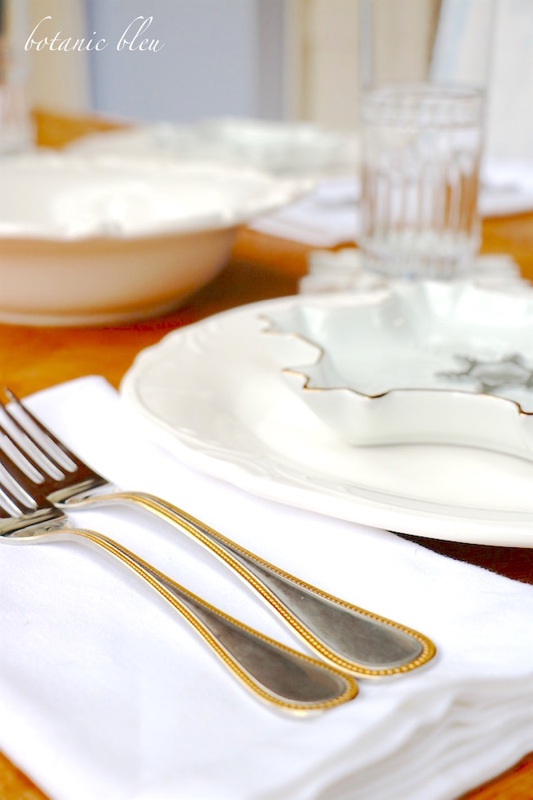 By using good china, real sterling silver, multiple plates and pieces of flatware, crystal, and fabric napkins, we become comfortable using them and learn which fork or spoon to use with which course. Children need the practice so that one day when they are older, they feel comfortable, not ill at ease, in formal meal settings. Job interviews in restaurants, wedding receptions, meeting future in-laws, and socializing with friends should be enjoyable social settings where young people make good impressions with their companions. Adults need refresher courses in what to do with all those dishes. If a person has little opportunity to learn how to act in formal meal settings, not only is the person nervous, but the person also may feel inadequate, embarrassed, and lose self esteem. I want my loved ones, and MYSELF, to feel good, comfortable, and relaxed at any meal. Whether it is an outdoor barbecue or a formal five-course sit-down banquet. Bring on the good stuff! China, silver, napkins, crystal, flower centerpieces.... and let the good times roll! Salad forks, water glasses, dessert plates... all used with ease. One of the reasons why we use certain things in table settings is to protect our tables. Dishes with hot food in them can damage table surfaces. Use some kind of hot pad between a hot serving dish and the table top. Think beyond common materials used to protect surfaces. Add a little fun to the table. Large white-washed wooden snowflake Christmas decorations are the perfect size for many serving bowls. Two wooden snowflakes placed end to end are the right size for a rectangular baking dish. Another thing we have to teach our children is how to take care of our possessions by using placemats, coasters, and hot pads. There are more HOWs than WHYs in creating tablescapes. 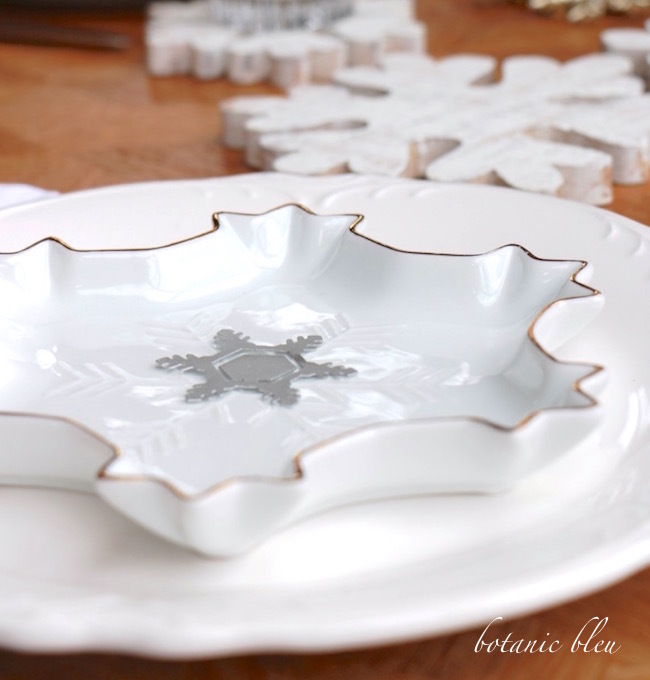 The remaining ways are how I created the snowflake winter tablescape. Most of us do not have resources to buy all new things to create a beautiful table setting. Get creative and think beyond the intended purpose of objects. Using the large Christmas wooden snowflake decorations as hot pads is one way to use an object in an entirely new way, doing double duty. Things used more than one way is cost effective, storage space effective (not as many things are needed), and often give an unexpected delightful twist. When creating a tablescape, look around your house and gather up everything that fits the table theme. In this case, SNOWFLAKES. You may or may not use everything, but you may find a creative way to use something unexpectedly. 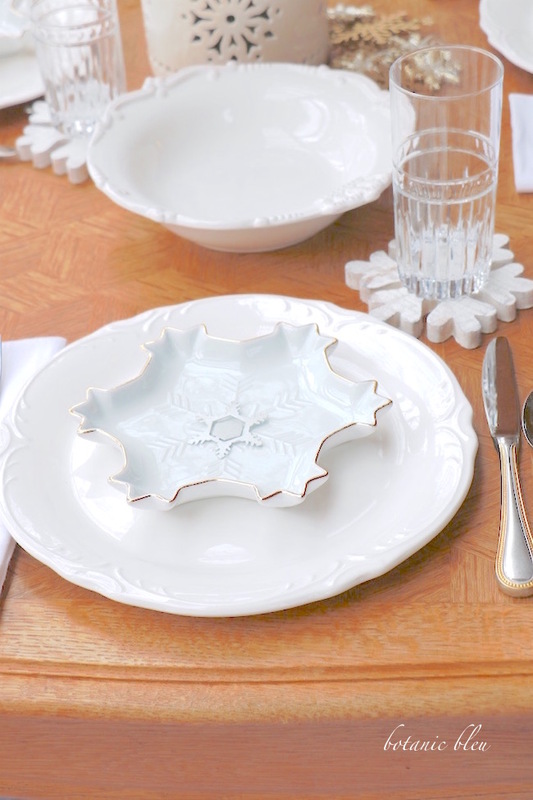 Here are some things doing double duty in the snowflake winter tablescape. 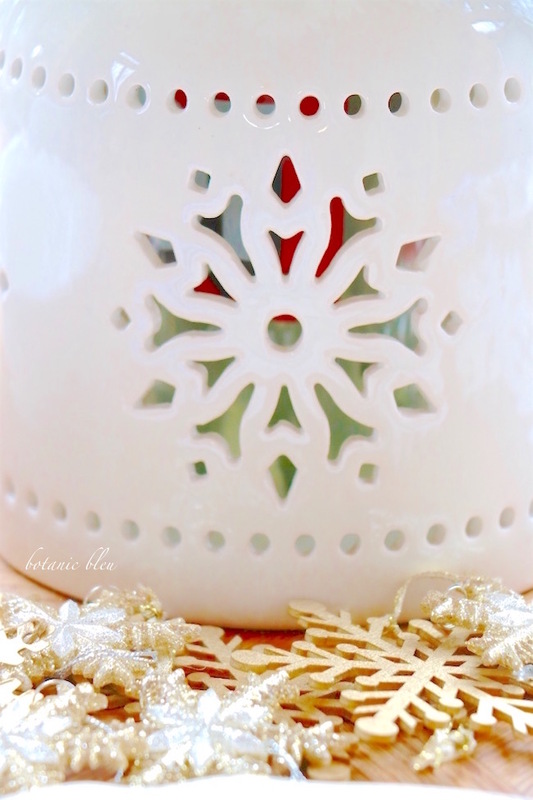 A white ceramic snowflake candle holder is the flower vase centerpiece. Look closely through the cut-out in the lantern, and you can see the plastic fast-food drink cup that is holding the water for the flowers. Glittery snowflake Christmas ornaments scattered on the table sparkle like fresh snow. Small Christmas wooden snowflake ornaments serve as glass coasters. An unexpected, but great way, to protect the table from condensation. 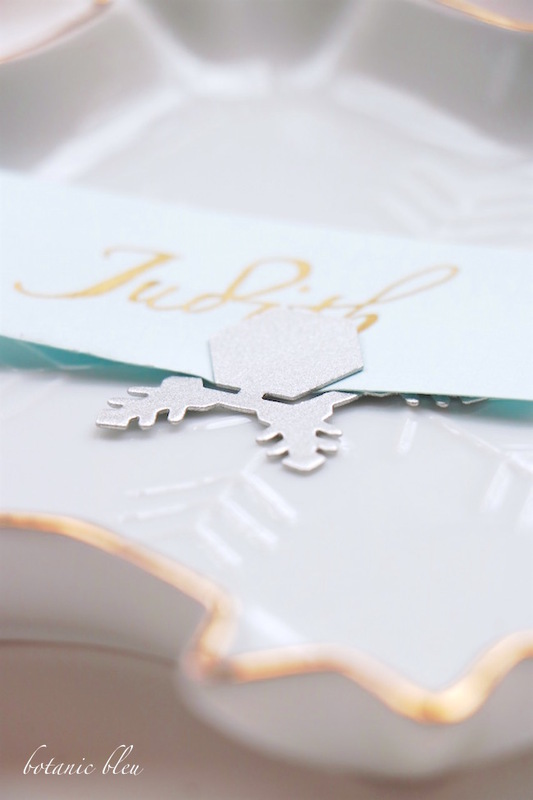 Metal snowflake paperclips are place card holders and can be party favors for guests. Shop office supply stores and gift shops for unusual paper clips. If traveling abroad (France or other countries), look for paper clips at stationery shops (papeterie in France). See Place Setting Layouts on my Pinterest board, Cuisine, for diagrams of formal and informal place settings. Of course, if I am ever invited to Downtown Abbey for a meal, I will need to review British place settings. What suggestions do you have for why and how to create beautiful tablescapes? Monday Social, a linky party I co-host, is a great place to share photos and links to your winter and Valentine's tablescapes. Show how you use things creatively to do double duty. 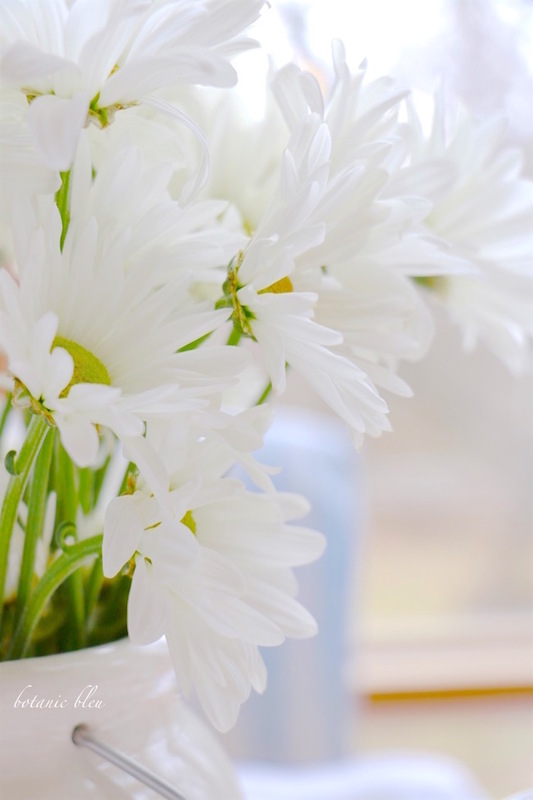 What do you use for flower vases? 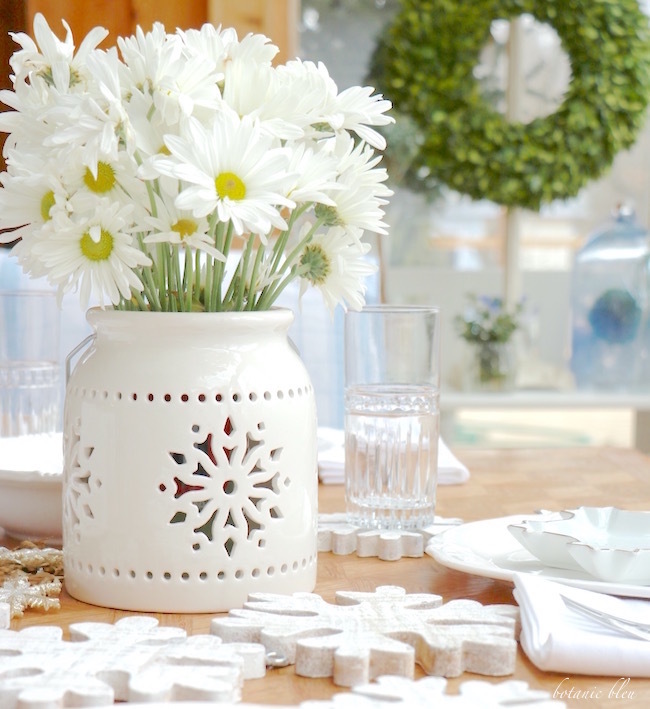 What tips do you have for creating centerpieces? Judith, as always you have presented an interesting topic while highlighting the details with your gorgeous photography. I admire your sense of style and your thoughtfulness. Beautiful post! I agree 100% with everything you wrote! Every day is special and should be celebrated. Thanks for a beautiful post and reminder of WHY young people NEED to know everything you mentioned. Being able to be comfortable in any setting makes for a well rounded person that others like. You're advice is "right on" as always. And what a gorgeous table! Not only is your table gorgeous so is your photography. Your outlook and philosophy on life is always inspiring! Bonjour Judith! You have styled your table and this post / presentation so beautifully! Every detail is stunning. I love how you allow us to peek into your creative mind with every word! 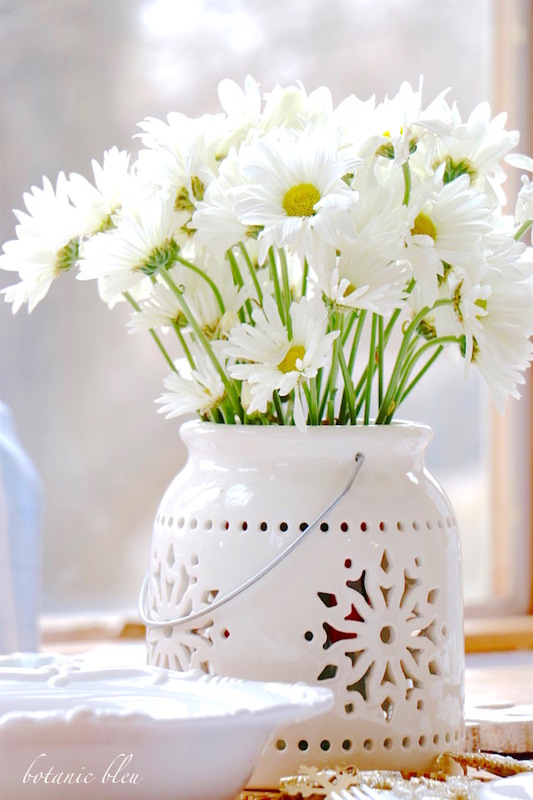 Your mix of Daisies and snowflakes are a message of the lighter days ahead! Judith, everything on your table is exquisitely beautiful!! I especially love the silverware...so unique! Your decor is always so elegant and tasteful...with no detail left out. I love these decorations for January! Love and hugs! of course more elaborate ones for special ocassions or holidays. What good points you have brought up! When I photograph food the kids always feel special if I give them the sample for the shoot because it is presented so different from everyday! It does brighten the mood! Thanks for sharing at Home Sweet Home! Judith, you know I'm a fan of your French Design on Friday posts, and I adore fine linens and textiles, vintage or not. Years ago, a French woman began the trend of dying the antique linens. She had a shop in the 6th or possible the 15th, I don't remember exactly. At the time, she was featured in several magazines, which is how I found her.